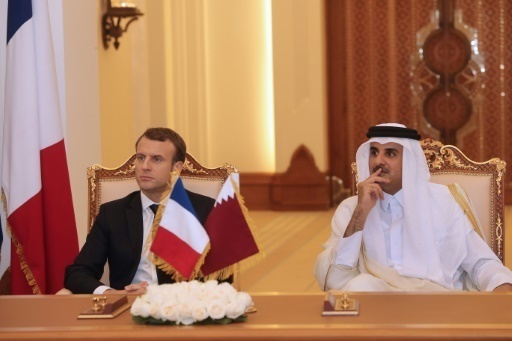 Visiting French President Emmanuel Macron and his Qatari host Emir Sheikh Tamim bin Hamad al-Thani have overseen this Thursday the signing of €11-billion package of contracts including acquisition by the Emirate of 50 A321 neo and 12 Rafales. The French President arrived in the Qatari capital Wednesday for a state visit, part of Paris’s endeavor to try to defuse the diplomatic spate between the small emirate and its neighbors led by Saudi Arabia. Saudi Arabia, United Arab Emirates (UAE), Bahrain plus Egypt on June 5 severed ties with Doha accusing it of sponsoring terrorism. They busted sea, land and air links with Qatar. The visit laid the ground for sizeable contracts ranging from railway transport, aerial transport to defense. Qatar under an agreement with the French government will purchase 12 Rafales for a total of €1.1 billion on top of 24 already signed up for in April 2015. Doha also signed a Memorandum of Understanding (MoU) for extra 36 fighter jets. Aside from the military aircrafts, France under another MoU will supply the Qatari military with 490 armored infantry vehicle (VBCI), Nexter type. The contract is estimated at €1.5 billion. It could reach €3.2 billion depending on the equipment to be mounted on the vehicles, reports say. France’s SNCF and RATP will work with Qatar’s Hamad Group for the maintenance of Doha subway and the tramway project in the city of Lusail, 20 km from Doha. Both contracts are estimated at over €3 billion. The agreement will run for 20 years. The other major deal consists in the purchase of 50 A321 neos by Qatar to the tune of €5.5 billion. The gas-rich country has abandoned the acquisition of 50 A320 wide body aircraft that it ticked off in 2011. Posted by KanelkaTagba on Dec 7 2017. Filed under Gulf News, Headlines. You can follow any responses to this entry through the RSS 2.0. Both comments and pings are currently closed.